Trees in a forest grow in guilds, rather than in isolation. Oftentimes their branches end up encircling one another or even intertwined. 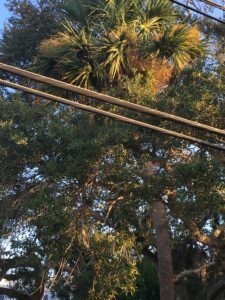 Here in Florida, a common sight is a palm tree growing up into the branches of an oak. This beautiful duo in my neighborhood offer a nice visual metaphor for human interdependency also. So did the palm tree nurse the baby oak seedling, or was the palm tree seedling nursed by the tall leafy oak? I imagine the latter, as the oak tree looks to be of a stately age, and palm trees don’t offer much shade. But it could have been a different scenario entirely. These trees sit on an empty, mostly grass lot which at one time was probably densely forested with a much wider variety of tree and shrub species. 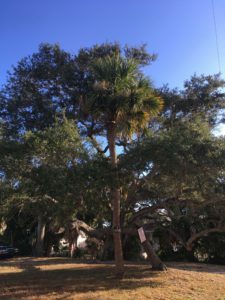 The article was published back in 2006 but it caught my eye because my city seems to be cutting down a lot of oak trees, as well as palmettos and other native scrub, from public lands, leaving little except wide expanses of buzzcut turf grass and palm trees. A lot of homeowners seem to be doing this as well. It makes for a rather desolate, not to mention hot and relentlessly sun-scoured, landscape. Previous PostPrevious Edible Gardening is IN!